Netizens in Xinjiang hail return of Internet as bars wave boom times goodbye. 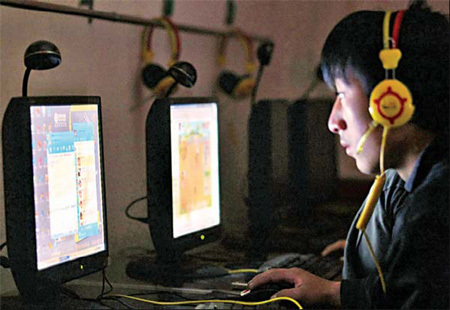 After 10 months of relative silence, Internet cafes across the Xinjiang Uygur autonomous region were back to their bustling best last weekend after the government restored the region's Web access. Residents were also rushing out to switch on the broadband connections they canceled during the 10-month blackout. Yet, although hundreds of thousands in Xinjiang welcomed the Web like a long lost friend upon its return on Friday, the move has not proved good news for everyone - least of all for the business that have profited from the lack of access. As people were forced to find alternative entertainment, cinemas, bars and karaoke (KTV) clubs have enjoyed boom times. "Our income almost doubled after the Internet was cut," said a manager called Zhang at the Bayinhe Karaoke Club in Urumqi, the regional capital. "But our bookings dropped sharply over the weekend because the Internet is back. It seems like our good times are over." Zhang expects business to pick up next week when the "novelty of having the Internet back wears off" but he fears it will never be as good again. Movie theaters and DVD stores saw no major drop in sales over the weekend, although analysts expect many people will return to downloading or streaming films and television shows online once high-speed access is restored to their homes. "We have actually benefited from the Internet blockage, so although I'm glad to see the Internet is back personally, for DVD shops this is not good news," said Li Ping, a DVD shop owner, on Sunday. Staff at China Telecom's call center in Xinjiang said they had received "a large number of phone calls" about cancelled broadband services after the government announcement on Friday. Apart from entertainment venues, however, most business owners hailed the decision to restore the Internet, which was closed down on July 5, 2009, following rioting on the streets of Urumqi that left at least 197 dead and 1,700 injured. "I had to set up an office in the neighboring Gansu province just so we could use the Internet," said a Uygur businessman in his 50s who did not want to be identified. "I employed two people just to reply and send e-mails, which added cost to my business. "I understand the government cut the service to maintain social stability but I believe economic development is equally important," he added. The regional government partially lifted the Internet ban last December by allowing access to 31 websites. International phone calls and mobile phone text messaging services, which were also cut off after the riots, are now fully available again. Millions of netizens let out a collective sigh of relief as they rushed back to their blogs, forums and chat rooms after the switch was flipped at midnight on Friday. "I shed tears when I visited Baidu (China's most popular search engine)," wrote one Web user at iyaxin.com.cn, a Xinjiang-based website, just an hour later. "The resumption of the service shows the government has become confident about combating terrorists (it is suspected the riots were organized by using the Internet) and is not afraid of them." Li Bin, a 32-year-old Urumqi bank worker, was woken in the night at 2 am by one of his excited friends. "My friend was literally screaming on the other end of the phone," he said. "He told me the Internet was back. I didn't believe him at first because there has been so many rumors about when the ban will be lifted flying around and none of them were true. You can see how desperate Xinjiang people are to be reconnected. "The speed of the Internet has been extremely slow but it is understandable because I can imagine how many netizens are flocking to it," said Li, who said he spent his weekend chatting to friends and updating his computer systems "just like netizens across China". Like many others, he aired his feelings with his blog at MSN, which he last updated on July 5 about the ongoing violence. "Now our life is really back to normal after the riot," he wrote. Internet cafes, or wang ba as they are called in Chinese, were overrun with customers at the weekend. Rows upon rows of people sat chatting merrily into Web cams, while others played online games or downloaded music. Many people even complained of being unable to find a vacant computer to use. "It deserves celebration," an Internet cafe owner in Urumqi told China Daily on Sunday. Julidez, a university student from Kazakhstan visited three net cafes until she found an empty seat on Saturday. "I sent all my friends and family an e-mail telling them that the Internet in Xinjiang was switched back on. Everyone in the cafe was so excited," said the 21-year-old. "As a foreigner, I felt isolated from the world without the Internet. Also, I couldn't use MSN (instant messenger) or Skype (online telephone), which act as the links between me and my friends and family back home." The Xinjiang Normal University student arrived in the region last November, when the International call service in the region was also blocked. "I was so frustrated then because there was no way to contact my family in Kazakhstan to tell them I was safe," said Julidez. However, not everyone was so eager to get caught up in the Web again. A street poll of 100 random people by China Daily in Urumqi before the switch on found that only 10 percent felt "severely affected" by the loss of Internet access. Almost 70 percent said they could cope comfortably with the situation, while 21 percent said they did not miss the Internet at all. Some people even claimed the 10-month blackout was like a mental detox. "It was hell for the first couple of months without the Internet, which I think I've been addicted to since 1999," said Luo Liang, 29, an advertising planner in Urumqi. "I didn't know how to entertain myself. I felt so frustrated and helpless. "But then I started to find alternatives to keep me occupied, such as watching movies and going to KTV with my friends. I later realized that my dependence on the cyber world is actually an addiction," she said. Luo even started to learn Japanese, which she has always wanted to, by utilizing the time she normally used to surf the Internet. "My attitude towards the Web has changed. I've learned that there is more to life than Internet," she added. American Josh Summers, an English teacher and blogger who has lived in Xinjiang for more than three years, said although updating his website, farwestchina.com - became impossible without access to the Internet, "life as we know it didn't come to an end". "In fact, there are some perks to being disconnected," he said. "I read more books, saw more of Xinjiang's countryside and - my personal favorite - spent more time with my wife. E-mails no longer sucked up all my time and I could visit my neighbors often." Many netizens credited Zhang Chunxian, the region's newly appointed Party chief, for lifting the ban. However, the move is more likely due to the fact that the regional authorities are confident they can now prevent the Web from being used as a tool to fuel the kind of violence that was seen last July. "The overall situation in Xinjiang is stable now," Hou Hanmin, spokesperson for the regional government, told China Daily. "The region is to usher in a new era of economic and social development in which the Internet plays a very important role. So the timing of resuming the service is right." The regional government's ability to control the Internet has "improved a lot" after the riot, she added. 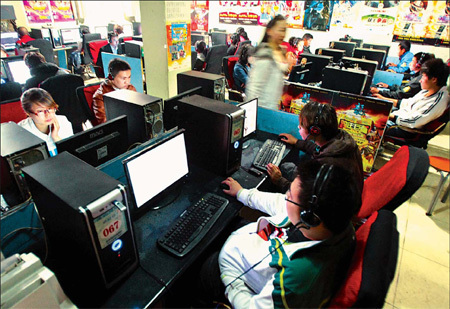 "Rather than shutting down the service, the government should improve their monitoring and control the Internet so it won't be used by terrorists," said an Internet cafe owner in Urumqi. The resumption of services comes days before the upcoming central government's working conference on issues affecting Xinjiang, in which detailed and massive investment plans are expected to be introduced to boost the region's economic growth. China is set to see a booming art market in 2010 when wealthy people in the country look to diversify their investments. Singers perform at 2010 Wango Tango concert in L.A.